February 1st saw the appearance of my guest post on A Writer of History, the book blog of historical novelist M. K. Tod. She’s the author of Time and Regret, her third novel. My post deals with my writing career and the career(s) that preceded it. Christopher Mellon, deputy assistant secretary of defense for intelligence in the Clinton and G. W. Bush administrations, wrote a March 9, 2018 article in the Washington Post. In it, he scored the government’s apparent lack of interest in recent sightings by military and airline pilots, radar controllers, and ground observers. These aerial events, he said, “…appear to provide evidence of the existence of aircraft far superior to anything possessed by the United States or its allies.” Below, in “Stop the UFO,” I discuss one aspect of Mellon’s concern, starting with a recounting of one of the Northwest’s best-documented, and most perplexing encounters. In a second entry, “The Notorious La Bajada,” I revisit a New Mexico landmark familiar to me from my years living there. If you’ve ever driven to Santa Fe from Albuquerque, you’ll perhaps recall a feature that became part of the history of the famous Mother Road—Route 66. If you haven’t yet, please take time to view the one-and-a-half minute video trailer for my novel, titled “Illusions of Magic book trailer.” It’s easy to find on Youtube. Below, in Wisdom with a Smile, one of my favorite dogs makes his appearance. Art lovers in the New York vicinity have many opportunities to enjoy their passion. As mentioned in my February blog, I’m a member of New York’s Salmagundi Club. It plays a strong hand in that city’s art scene. Below I’ve excerpted most of a March article in which the New York Post featured the Club. I think you’ll find some of the items in Lois Weiss’s article unexpectedly fascinating. This month we begin again to enjoy the great Northwest. Happy Spring to all of you! In broad daylight on October 25, 2017, something extraordinary occurred in the air over Oregon and California. Pilots of several different commercial airliners reported a mysterious sighting, described as a large, “white” aircraft. It flew as fast or faster than airliner speed at an altitude of about 37,000 feet. Its presence was confirmed on radar screens on the ground, and later verified by both the Federal Aeronautics Administration (FAA), and by the North American Aerospace Command (NORAD). Yet the aircraft did not respond to radio inquiries, did not appear to the airliners on the TCAS (Traffic Collision Avoidance System), and evaded identification by Air Traffic Controllers (ATC) on the ground, either because it had no transponder, or because its transponder was inactive. The mystery aircraft’s initial course, southbound, later reversed to northbound. Because it was an unidentified intruder into U.S. airspace, Air Force F-15 jets were launched (presumably by NORAD) to intercept. They failed to locate the aircraft. Subsequent investigations by several government aviation agencies yielded little additional information. A FOIA request has produced recordings of most of the relevant radio traffic, radar scans, and telephone conversations. These recordings are available on the Internet. Since mid-20th Century, the use of acronyms to substitute for longer strings of words has proliferated. UFO, an abbreviation for Unidentified Flying Object, was coined in 1953 by the U.S. Air Force as a convenient way to describe objects in the sky that did not fit standard criteria for identification. Most of these were later identified as conventional objects or phenomena (see “Project Blue Book). Some, however, led to theories of visits by extraterrestrial craft, or “flying saucers.” Novel explanations for these sightings, often abetted by fanciful illustrations and Hollywood “extrapolations,” caused the term UFO to denote an alien craft, something from an unworldly realm. This connotation has become so fixated in the imaginations of the general public that mention of “UFO” almost always indicates the arrival of strange craft bearing visitors from distant planets—aliens of extraordinary appearance and abilities. Yet the reports of the October 2017 sighting over Oregon and California describe the unidentified object as an airplane. It was, most likely, piloted or at least controlled by a human rather than an alien lifeform. On the other hand, a search of this event on Google produces dozens of results with UFO in their headings. Unfortunately, because of the link of “UFO” to other-worldly phenomena, many of these stories indulge in overheated and unnecessary inflation of the sighting into bizarre realms—even scary “invasion” scenarios. This misappropriation artificially colors the event, making the task of investigation more difficult. For example, weird extrapolations beyond verified reports can intimidate otherwise reasonable people into refusing to give accurate account of a sighting. They rightly fear they’ll be exposed to ridicule for indulging in fantastic invention. My comments here are not to indicate that the October 2017 event is anything other than mysterious. It is mysterious, bizarre, weird, and—so far, at least—unexplained. But there’s nothing in the reports themselves to indicate the involvement of alien lifeforms in a spaceship. After almost 70 years of perhaps useful life, the term UFO has, I believe, outlived its original usefulness in describing events like the October 2017 sighting. It might usefully and more accurately be replaced by a different abbreviation such as AAO for Anomalous Aerial Object. If you drive north from Albuquerque on I-25 to Santa Fe, you may not even notice it. Four lanes of smooth pavement and a little extra push on the gas pedal, and quickly the beautiful Sangre de Cristo Mountains loom into view. When first laid out in 1926, Route 66, the famous Mother Road stretching from Chicago to Santa Monica, California, was unpaved. From Texas, it entered New Mexico near Tucumcari, looped north from Santa Rosa, passed through Santa Fe, New Mexico’s capitol city, and descended La Bajada hill southwest toward Albuquerque. From there it again coursed westward through Gallup and on into Arizona. Originally, La Bajada was notorious for its 1-1/2 miles of torturous rock road. A warning sign erected by the New Mexico State Highway Department read: “La Bajada Hill – Warning – Safe Speed 10 Miles – Watch Sharp Curves – This Road is Not Fool Proof.” The road’s 23 hairpin turns became scenes of countless travel frustrations from overturned wagons to steaming radiators. Automobiles of the time bound for Santa Fe sometimes had to back up the hill in reverse gear to arrive in the Capitol. This was due to rear-mounted gas tanks, which needed to be elevated to allow gravity-fed fuel to arrive at the motor. Later, in what became known as “The Last Laugh of Governor Hannett,” a roadbed trending straight west from Santa Rosa was roughly bladed at the Governor’s direction by a state crew using some old graders and dilapidated World War I caterpillars. In a little over a month in December of 1926, they cut through 69 miles of virgin ground, both public and private, with little regard for rights-of-way, ending their task in Albuquerque. Hannett, who’d lost his 1926 re-election bid for Governor, hoped the hastily-built, shorter route would become the favored path across New Mexico. 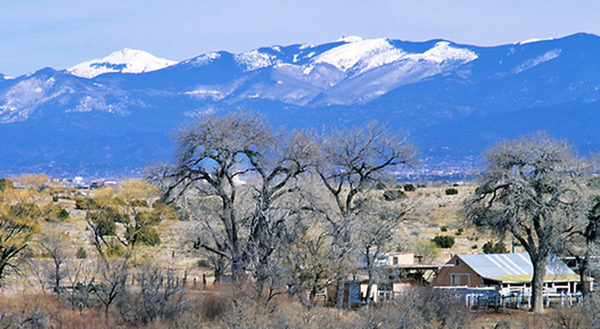 The road did become the main route for cross-state traffic, although Route 66 through Santa Fe retained its marking for five more years. Ex-governor Hannett hoped tourists following the new road that bypassed Santa Fe would exact revenge on local businesses and politicians whom he thought had engineered his defeat. In the mid- to late-thirties, during the paving of Route 66, the straight-line segment authorized by him became the officially-designated Route 66. The new highway traversed about 400 miles across the state, nearly a hundred miles shorter than the original Route 66. The new route forever avoided notorious La Bajada, the steep escarpment the Spanish designated “The Descent.” And by bypassing the state capitol of Santa Fe, it unintentionally gratified the former Governor’s desire, yielding Hannett’s last laugh. I don’t own a dog, but I like them and I sense they like me. Take, for example, Martin. (Yes, that’s Lizz’s dog, Martin.) He’s a very social dachshund. When we’re sitting out on the deck and Lizz walks by, Martin scampers up the steps with his tail doing 90-miles-per-hour wags. I holler, “Hey, Martin. Good to see you!” And, because he’s just about the friendliest dog you’ve ever met, he shoots past me to smell the screen door. Then he smells the floor lamp, and, as fast as his stubby legs will go, he smells the table leg, followed by the chair legs (all four for every chair), followed by . . . you get the idea. A story in the February (2018) blog detailed my membership in the Salmagundi Club. The following, excerpted from an article by Lois Weiss that appeared in the New York Post March 6, 2018, provides more particulars about the Club, its members, and the brownstone clubhouse. The landmarked Salmagundi Club has been used as a set for “Blue Bloods,” “The Blacklist” and “Girls” — while Tony Bennett is counted among its members. But the private club for both artists and art patrons also welcomes everyday New Yorkers who may use its spaces for events, take art lessons or simply browse its art-filled hallways, stairways and galleries. Its old-world private restaurants — the adjacent Dining Room and Grill Room – are wrapped in dark woods and feature Tiffany glass (made by the late Louis Comfort Tiffany, a former member) — along with plenty of artworks and gargoyles. A round of billiards at one of the club’s three vintage tables is also a popular pursuit – with or without cocktails. “It’s the best-kept secret,” said the club’s first vice president, Elizabeth Spencer. Started in 1871 by local art students and friends as the Salmagundi Sketch Club, the club’s name came from the satirical “Salmagundi” periodical published in the early 1800s by Washington Irving and James Kirke Paulding. Unlike other art clubs, you don’t have to be an artist to join, explained Tim Newton, Salmagundi’s chairman and chief executive. It wasn’t long after the club’s founding that the artists realized that it was beneficial to include patrons as members. That quickly bore fruit in 1917, when art sales and patrons came up with more than half the $75,000 needed to buy what was then a four-story rooming house between 11th and 12th streets in the heart of Greenwich Village. Within a few years, the club burned its mortgage, Newton said. The Italianate-style brownstone, with 22 fireplaces, was originally built in 1853 as the residence for Sarah and Irad Hawley, who owned the Pennsylvania Coal Company. It became a rooming house after she died in 1891. The couple’s former boudoir on the second floor is now a library filled with a treasure trove of historical books and artifacts from the club’s founding years. A servants’ staircase, running from the lower levels to both the children’s floor and the top servants’ floor, may soon be converted into an elevator shaft under plans drawn up by historical architects PBDW. “We want to keep the spirit of the house,” Newton says of the $13 million campaign underway for upgrades and the restoration of the upper floors. Newton came to the club through a serendipitous encounter with a member at the Dallas Airport. An art catalog started them talking, and soon Newton was hooked. Art classes are available to walk-ins with their own supplies for a mere $20. There are other ongoing events. Along with quiet meeting and thinking rooms that all double as galleries, the club’s recently renovated first floor gallery is a classic, white modern space, available for parties and even movie shoots. During the twice-yearly Washington Square Outdoor Art Exhibit, the Salmagundi Club serves as its headquarters and a gathering place. There are currently about 1,000 members, with one-third of them living within 50 miles. The remainder live all over the country, Newton said, and pay a reduced membership fee. “Membership has doubled in the last 10 years. For a while, we went off the grid,” he said. While patrons are installed based on member referrals, artists apply and are accepted based on their artwork. Even non-members can apply to show in various exhibitions. “To be accepted into an exhibition is a great honor,” said Newton. Thanks for all those reading and reviewing Illusions of Magic.